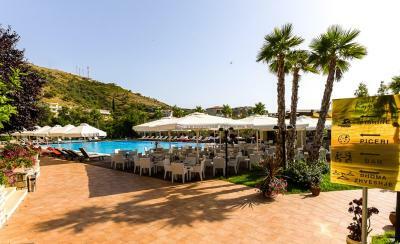 Nice big pool with plenty of sunbeds. Nice staff in the bar (thanks Ari) View from the balcony to the sea was great. The pool and close access to the beach. Room was clean. The service at the restaurant was very nice. The staff was so kindly. The location was great. The security guard made us feel very safe and welcome. Greeting was okay. 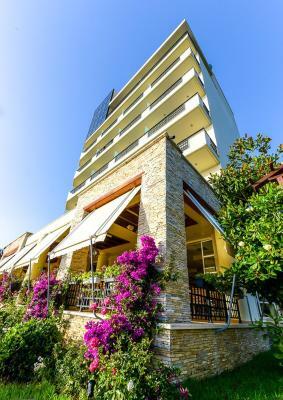 The location close to the sea, the view from the balcony and the garden. The balcony view is fascinating. Very good and clean pool and staff services are good also in the beach. Parking places always under shadow and safe. The pool, the garden, and the staff communication, especially Shkelzen who was very polite and standing up each time we went through lobby. 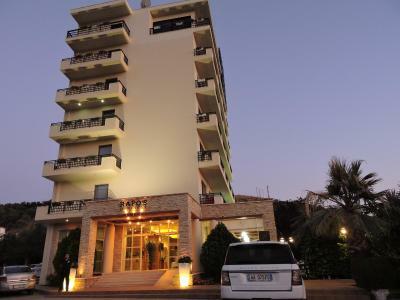 The hotel is well located near the beach. Rooms are enough big and well furnished but bathroom a little small but ok. Pool is amazing also the pool bar. Beach of course is perfect. Breakfast is good enough. 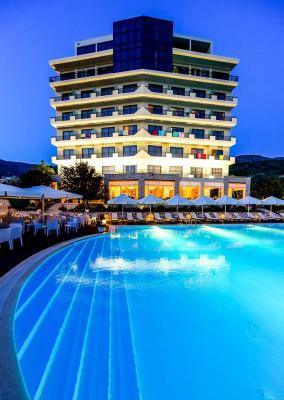 Hotel is clean and overal this is one of best hotels in Albania. 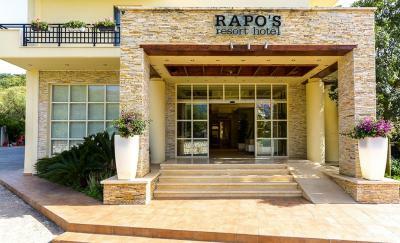 Rapos Resort Hotel This rating is a reflection of how the property compares to the industry standard when it comes to price, facilities and services available. It's based on a self-evaluation by the property. Use this rating to help choose your stay! 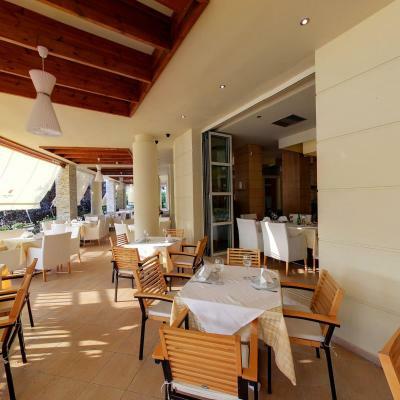 Rapos Resort Hotel is located 150 feet from a pebbly beach and 0.9 mi from the center of Himare. 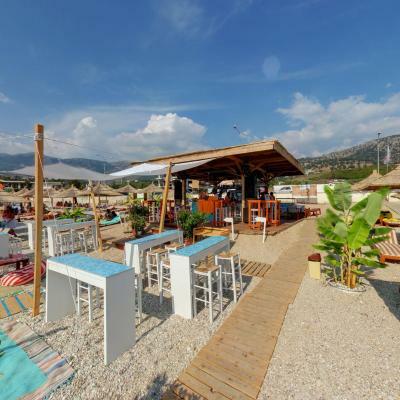 It offers a bar and restaurant with a terrace, an outdoor pool and a private beach. Free Wi-Fi and parking are provided. 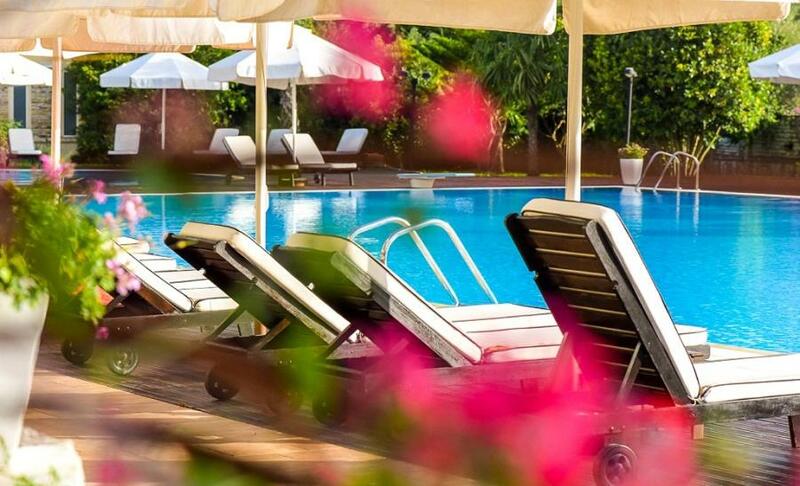 All rooms are fitted with air-conditioning, a mini-bar, a seating area and a flat-screen TV. Private bathroom provides a shower. Most rooms overlook the sea. 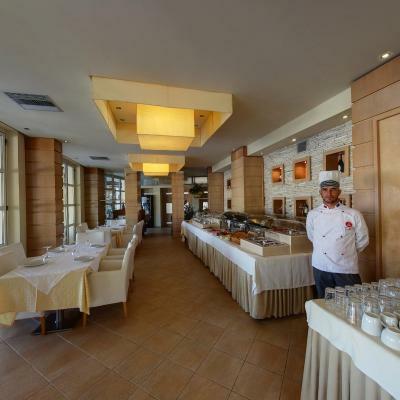 The on-site restaurant serves traditional Albanian and international specialties. There is a children’s playground nearby, while a night club can be reached in a short walk. There is also a grocery store nearby. The nearby tourist agency offers excursions to historic sites of interest, while jet ski rental is possible at the nearby beach. Local buses stop just a few steps away, while the Main Bus Stop is 0.9 mi away. Ferry Port in Saranda, with lines to Corfu Island is 32 mi away. 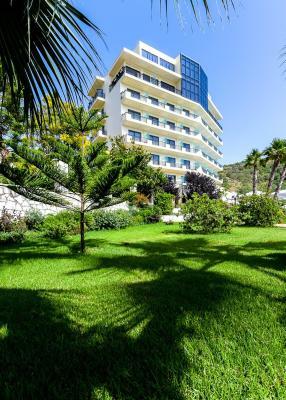 When would you like to stay at Rapos Resort Hotel? Air-conditioned room with a flat-screen TV, a mini-bar and a desk. 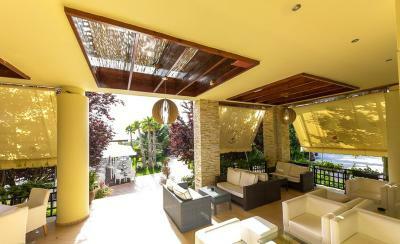 Private bathroom provides a shower, while the balcony offers a view of the sea. This unit offers 2 interconnected bedrooms with air-conditioning, a flat-screen TV and a mini-bar. Private bathroom provides a shower. There is also a balcony with sea views. Spacious suite offering a flat-screen TV and a mini-bar. Private bathroom provides a shower, while the suite overlooks the sea. Air-conditioned suite offering a flat-screen TV and a mini-bar. Private bathroom provides a shower, while the suite overlooks the sea. 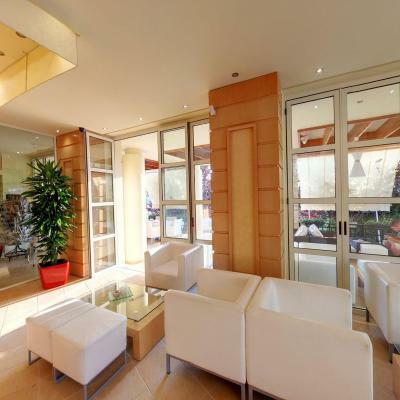 Spreading over two levels, this suite offers modern amenities and a view of the sea. It offers a mini-bar, air-conditioning, a seating area and a flat-screen TV. The balcony overlooks the sea. 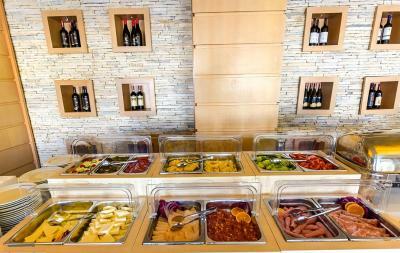 House Rules Rapos Resort Hotel takes special requests – add in the next step! 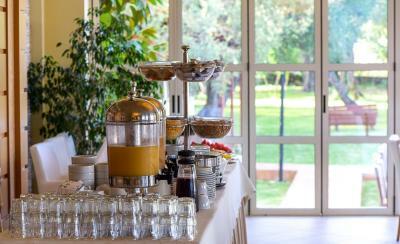 One additional child from 5 to 15 years is charged EUR 15 per person per night in an extra bed. Rapos Resort Hotel accepts these cards and reserves the right to temporarily hold an amount prior to arrival. 1. Being a British person who travels the world I cannot believe there is no fire alarms or detection systems within the hotel. So if there is a fire you are screwed basically. There was a fire extinguisher at the top of the stairs and a hose reel! 2. Only 1 emergency light in operation on the stair well. The 6 floor where we were had no light at all! 3. Breakfast- poor standard and lack of choice. 4. The room was supposed to be a suite. Struggling to understand what made it a suite. It was basically a double room. The breakfast was poor for a 5star hotel. No warm eggs att all. Cheap croissants from the freezer. The shower was way to little to stand in for an avarage sized person. Location was not the best. Nice view from the 5th floor rigjt onto a building site. The elevator felt dodgy. Everytime we got in to go down the first 10-15cm felt like freefall. Overall quality felt like a normal 3 star hotel. We thought the 5 stars were self rated. The room was not so good. no hot water, the room was hell hot at our arrival and the air conditioning did not work properly, many insects (beetles) inside the room and in the toilet, the reason why we did not try the restaurant for dinner. Drinks in the beach are a littel bit expensive considering the real value. Access from the hotel to the beach is not in good conditions so take in the consdier what kind of the slippers you have when you take this path. Dogs barking, mosquitos, noisy and very weak air conditioning affecting the quality of sleep. Breakfast was good but it could be better for a 5-star rating.